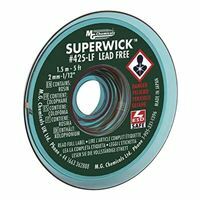 Any place you can put solder in, you can take it out with our Lead Free Super Wick. Specifically designed for high temperature, lead free solders. Also works great with conventional tin/lead solders. More strands of copper (more surface area) per square inch. Able to transfer heat to solder joints more quickly and efficiently than conventional desoldering braids. No Clean. Static free bobbins. RoHS compliant.